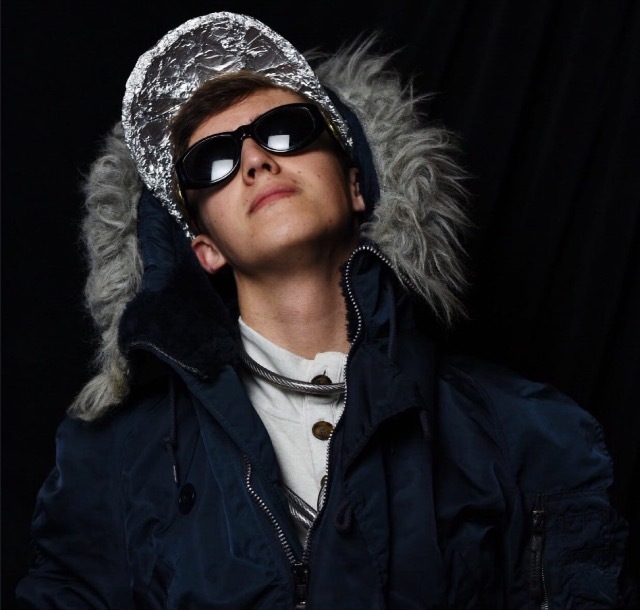 Dressed in a cap lined in aluminum foil and a fur-trimmed winter coat inappropriate for the California summer morning, Jackson Kienitz takes his place behind a silver microphone. He queues the background for the track he’s previewing and starts rocking his shoulders to the beat. Gazing straight at the microphone in front of him, he starts shouting in a high-pitched whiny holler. For almost a year now, Kienitz has been sculpting his eccentric character by staking jNitz’s territory through parodic raps online and performing at local student events. Like the rest of the student population, Kienitz spends most of his time working on homework, listening to music and hanging out with his friends. He also spends a good portion of his time rehearsing and performing in plays. Since Kienitz has plenty of stage experience — he’s been in over 30 plays, by his recollection — it’s no wonder he’s so impressive while in character as jNitz. When we met up with Kienitz for an interview, he was unreserved and charismatic. He’s polite when he needs to be, and he’s funny when he wants to be. He talked about how he was planning to incorporate some elements of the late New York-born rapper Biggie Smalls into jNitz’s character. He’s humble and comfortable with self-deprecating humor: That’s likely how he’s able to perform confidently onstage to the public as the caricaturistic jNitz. jNitz, however is an awkward and arrogant musician: a “self-proclaimed rap star,” as Kienitz says. 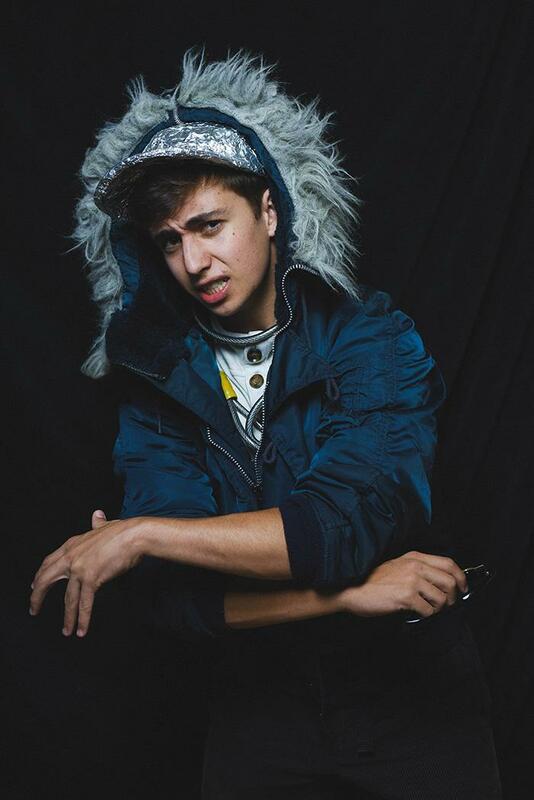 The tendency of many hip-hop artists to overhype themselves, most notably Kanye West, inspired the character of jNitz. He isn’t trying into insult mainstream rappers, he clarifies — he just thinks there’s a comedic opportunity in emulating their narcissism. “He [jNitz] knows he’s got talent, he knows he’s got musical genius and is not afraid of flaunting that,” Kienitz says, smiling as he leans against the railing behind his seat. The peculiarities of the character are fully thought out. The name, a pretentiously stylized contraction of “Jackson Kienitz” consists of a lowercase J and the second syllable of Kienitz. The jNitz wardrobe is flamboyant and ludicrous. Among the foil hat and winter jacket are a monogrammed “jNitz” camouflage coat and a Peruvian farmhat. As Kienitz dons the character of jNitz for us to see, he puts on large-framed black sunglasses. They’re vintage Versace, as indicated by the gold Medusa logo conspicuously decorating the temples. The rule of jNitz’s aesthetic is simple, he informs us: the bigger, the better. He also wraps a bike cable around his neck, fastening it with a padlock and a key hanging out. He points out the brand of the lock — Master. “I like to keep it as a reminder to myself that I, jNitz, am a master,” he says, as he adjusts his sunglasses. Gazing intensely at the camera, jNitz splays his hand as one of his signature poses. As jNitz, Kienitz demonstrates some of the rapper’s dance moves. Compared to Kienitz, jNitz makes large hand gestures. He trots arounds awkward-footed, facing downward as he flaps his arms. Pretentious as ever, jNitz classifies the wing-flapping as biomimicry — an imitation of nature. And of course, there’s the music itself, which Kienitz satirically characterizes as post-neo-modernist rap. It consists of unattractive built-in Garageband beats, self-produced basslines and nasal rambled lyrics. In his older material, the lyrics are a healthy mix between absolute nonsense and revealing — but likely fictional — anecdotes. As jNitz has matured, we’re starting to see lyrics that are more structured but still walk the line between clever wordplay and absolute nonsense, keeping that original jNitz flair. His dad, impressed by the work, pushed him to publish the track online, and soon, Kienitz’s Facebook friends had experienced jNitz for the first time via SoundCloud. “It was lame enough that people thought it was funny,” Kienitz says. Since he had, as jNitz says, poured his heart into the lyrics, he was nervous about how people would respond. “It [Floss Angeles] has a level of depth not found in a nursery rhyme,” Kienitz jokes as he leans back on the bench. After the initial release of “Floss Angeles,” Kienitz began investing more time in jNitz’s rap career, and started accepting his new identity as jNitz. 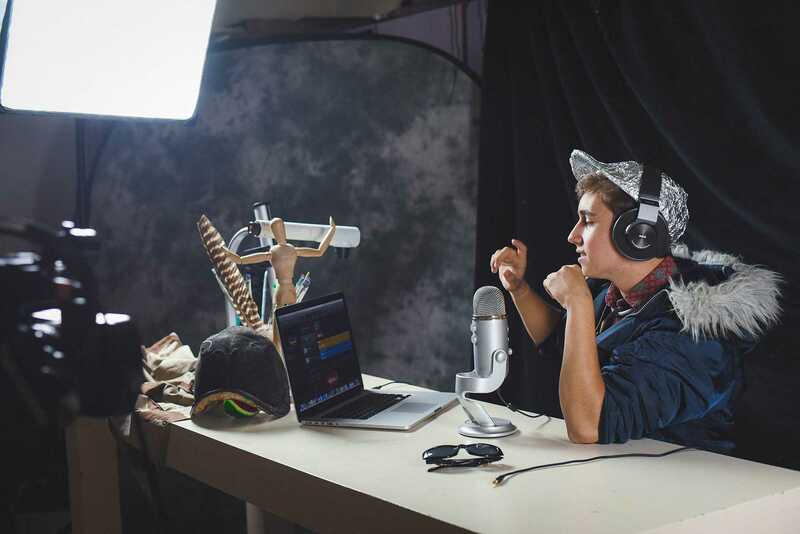 Although as an experienced actor Kienitz doesn’t suffer from stage fright, he says his first live performance as jNitz was nerve-wracking last March at the Teen Arts Council’s Open Mic. He specifically remembers looking at his flushed and sweaty reflection in the mirror while getting into costume. He worried that the attendees wouldn’t respond to his performance. As a recording of the event showed, jNitz delivered “Floss Angeles” with the expected ferocity, performing his trademark wing-flap in a heavy fur-lined coat to much applause and laughter. 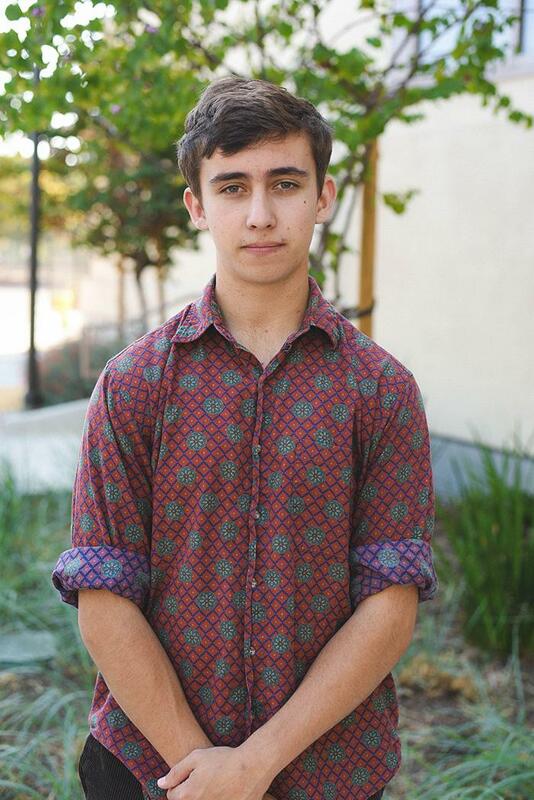 After nearly a year, jNitz has become a niche favorite within the Paly community. He’s currently working on a mixtape for his loyal fans, which he predicts will be released next semester, and he’ll continue performing at Open Mic events. In contrast to his currently released singles, “Floss Angeles” and “Back to the Roots,” the songs will include less freestyling — what he describes as “freshman” jNitz. If jNitz’s preview of “Famedom” represents at all what will be in the complete mixtape, it should be jampacked with humor, vitality and a continuation of jNitz’s absurd personality. Kienitz brings an intensity to the music, a testament to his talent. The lyrics and music may be silly, but Kienitz’s talent as a performer translates into his delivery. He implements colorful intonation to emphasize the absurdity of the material, all the while splaying his hands and performing wing-flaps to the music. Perhaps jNitz has a reason to be so cocky.